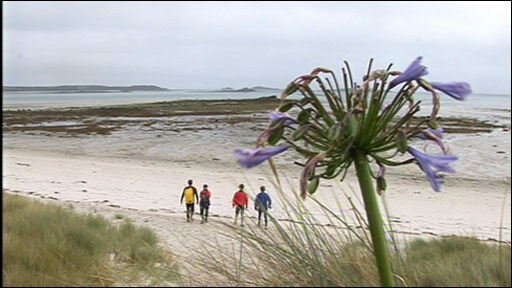 A group of people in the Isles of Scilly took part in a very unusual challenge at the weekend. One of the lowest astronomical tides of the year meant it was possible to walk between the islands. The group, which included BBC weather presenter David Braine, set off from Sampson, at times wading through chest-high water. 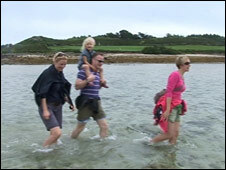 Despite successfully crossing to Tresco and Bryher, the incoming tide meant the attempt on St Martin was abandoned. However, the group managed to cross to St Mary's before high tide. Most of the islands in the Scillies are about 1km (0.6 miles) apart and the group covered a total of about 6.5km (4 miles). The Met Office said the astronomical low tides happen about two or three times a year. The next organised walk is due to to be held in September, with cover provided by RNLI beach lifeguards.